If there’s one thing I’m good at it’s saying “I’m okay”. I’ve been so used to saying it over the years. “Oh of course, it doesn’t matter. 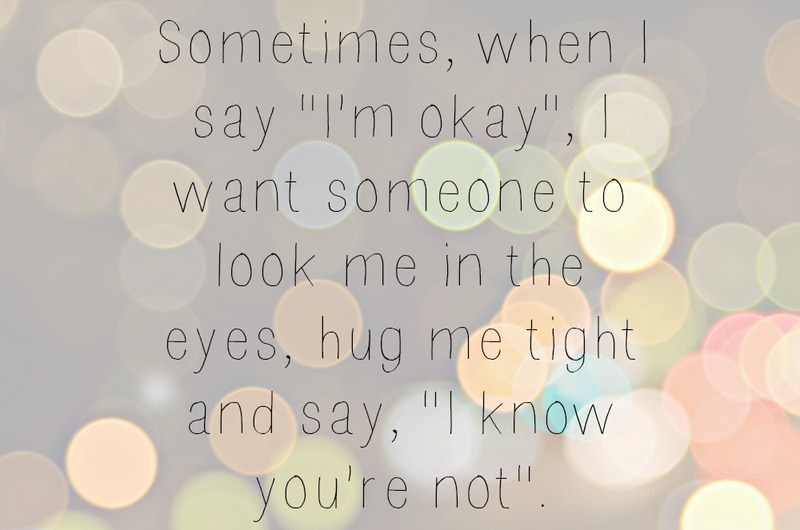 I’m okay”. “I’m okay” stops people asking questions. It diverts from the things I really don’t want to talk about. “I’m okay” means that people may still want to talk to me, and not see me as this negative miserable loser. “I’m okay” halts the awkwardness of talking about mental health. The awkwardness when people don’t know what to say, when people want to say “Why don’t you just not think those things?”. “You haven’t been on Twitter for a while, are you okay?” “Oh yes. I’m okay, I’ve just been busy”. The reality being that I sit there watching everyone else’s conversations not quite sure how to jump in. “Your blog posts are sad at the moment, are you okay?” “Oh yes, I’m okay. It’s just stuff I needed to get out. I’m okay though”. The reality is that I’m not okay, which is why I’m letting this stuff out. I have to say I’m okay sometimes, because it’s not easy to talk about. People either don’t understand, don’t know what to say (which I totally get, and is the reason I don’t talk about it) or it ends up a competition. I’m most certainly not going to compete over anxiety, and being overwhelmed by life. I have major trust issues at the moment. I wrote about this a couple of weeks ago. And in all honesty I miss the people I met at Britmums. The friends I (think) I made. It hurts, actually hurts, that I don’t live nearer to some of these people. It was like we were given a chance to meet people we’ve been talking to for days, weeks, months and even years and, we’re then able to see if we click in real life and if we want to consolidate our friendships. Really we have such little time to do that what with it only being a day and a half long, so many other people around, as well as sessions etc, and it’s really intense. Almost like you have this really short time to sell yourself, the real you, and a short time to decide on whether or not the people you really wanted to meet are as you imagined, meet your expectations, and if they are the kinds of people you can be friends with. I wonder if this was part of the trigger to my anxiety attack at Britmums. Knowing that the time to say goodbye was approaching and I wouldn’t have been able to deal with that. I see these friends online everyday, I don’t talk to them all everyday, other than odd one or two I am clearly stalking at the moment, but it’s not the same as them actually being there. Right there, next to you. I felt I had my spark back for a while at Britmums, like I was able to be myself at times, the real real me. I’m completely diverting away from the main topic, this stuff was supposed to go into a separate Britmums Friendship post. I stay at home a lot more than I should because I’m overwhelmed by having two boys at the moment. I worry I wasn’t made out to be a mummy. The worst bit being, that these feelings mostly came around because of people clearly watching us and judging us, not realising how obvious they are at doing it. And not realising how hurtful they are being by judging my children. JUDGING MY CHILDREN! If my son is excited about seeing me, being somewhere, doing something then I will not tell him to calm down if he needs to express that excitement in a positive way. I could rant about this forever. I really really could. I’m overwhelmed by school. Not in a panicky “ARGH MY BABY IS STARTING SCHOOL” but in a “boohoo he’s leaving preschool” because I love his preschool, the ladies working there, the friends he has made and will now be separated from and it breaks my heart. I can’t not cry when I talk to him about the schools his friends are going to. I have no idea how I am going to cope with saying goodbye next week. Ok, Harry will hopefully be back there next year but it doesn’t take away from the fact that Charles, my little boy who had his first full on crush there, has bonded with two special little boys there, has learnt a lot there, is ready to move onwards and upwards.